The new year is a good time to begin one of those daily reading books that you will finish in one year. Reading the Bible through in a year ought to be the very minimum for a believer, but there are also many good books on the shelf that are also divided up into 365 readings just for this purpose. I have done this for a number of years now, by keeping the book on my headboard and reading that day’s reading before I fall asleep (my wife claims that sometimes during it too!). I have read both volumes of this series and have enjoyed them very much. 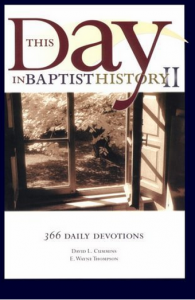 Volume one deals with more well-known names in Baptist history whereas this volume introduces lesser known people. I think it is vital that we know our Baptist heritage.